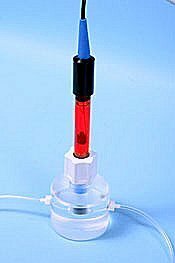 Purchase our micro flow thru redox electrode by itself or as a complete ArrowLabb(TM) Micro Redox Flow Thru Measurement System. The complete system includes everything you need to measure, log and graph all in one. System includes micro flow through redox electrode, advanced digital meter plus our exclusive logging and plotting software and more. Full details on flow through electrode systems. Description: Micro flow through ORP electrode with input and output ports utilizing standard 1/4-28 chromatography fittings. Applications: Water pollution, FIA, chromatography.